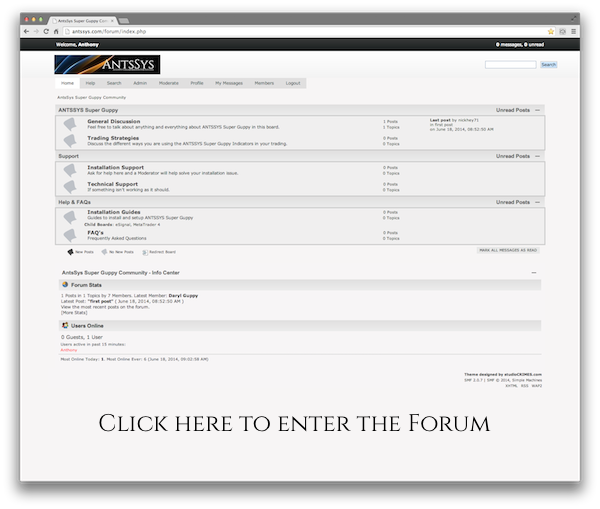 Welcome to the ANTSSYS Users Forum. Discuss your trading experiences and strategy ideas using the ANTS SuperGuppy Suite of Indicators with other ANTSSYS users. Raise any issues you may have or request help with installing our software with our moderators and support staff. Note : To register for this Forum you must be a current subscriber to the ANTS SuperGuppy Indicator Suite.